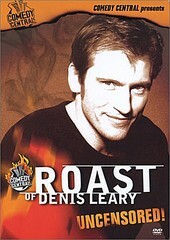 Though some of Denis Leary's movie choices have been questionable (something other comedians bring up during the roast), his best work is quite good and helps keep him afloat even during his less-than-impressive work. Very Bill Hicks influenced; Leary never reaches the level of Hicks, but does carve his own niche in the comedy world. Thus, this Comedy Central special roasting him is well deserved. With uncensored moments from the red carpet premiere (which aren't that funny), through additional footage, deleted scenes, and the cherry of the package, Denis Leary's uncensored rebuttal in its entirety, this DVD is a good time. A bunch of celebrities and comedians giving Leary a hard time while saluting him, it's a roast, and a good one. And though I found myself uninterested after watching it twice (second time was a little boring, while the first was great entertainment), it is still a good addition to a collection, as it is a piece people will want to borrow.